Out of the 324 U.S. Army WWII Congressional Medal of Honor recipients, only eight remain living reminders of the valiant acts of heroism that took place to secure our country's freedom. From selflessly taking fire to save fellow soldiers to advancing the front line through single-handed combat, the actions of these eight U.S. Army Veterans are a testament to the branch's motto "This We'll Defend." iFreedom Direct® Special Projects Manager and 23-year Army Veteran, Tim Lewis, says, “Without the courage of all our service members, America might look quite different." This year marks the 238th year of the Army’s existence. To commemorate the ocassion, iFreedom Direct®, a Salt Lake-based VA mortgage lender, dedicates a new Infographic entitled This We’ll Defend. The title is borrowed from the U.S. Army motto. The graphic showcases the bravery of eight living WWII Army veterans who have received the rare Congressional Medal of Honor. 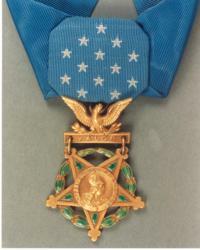 The Medal of Honor is the nation’s highest award for valor and is given sparingly to the most daring of daring individuals whose selfless acts of courage are well documented. The eight recipients featured in the graphic are the only remaining brave WWII veterans who still live to tell of their incredible accounts. They are Charles H. Coolidge, Francis S. Currey, Walter D. Ehlers, John D. Hawk, Nicholas Oresko, Robert D. Maxwell, Wilburn K. Ross and George C. Sakato. The graphic summarizes their stories of incredible valor. The accounts include a daring rescue, a grenade shielding, a one-man rush, carrying a wounded comrade to safety and other acts of bravery. On this day, 238 years ago, the Army officially began. As tensions rose in New England, Congress formed the Continental Army. The very next day General George Washington was selected as Commander in Chief of the brigade. The Army commenced our first battle for freedom, the American Revolutionary War. And, a year later the Declaration of Independence was signed. Since then, the U.S. Army has fought strong in 10 more U.S. wars and conflicts, with the most recent in Iraq and Afghanistan. If you know any U.S. Army service members, take a moment today to wish them a happy birthday. To learn more about VA loans from iFreedom Direct®, visit http://www.directvaloans.com.